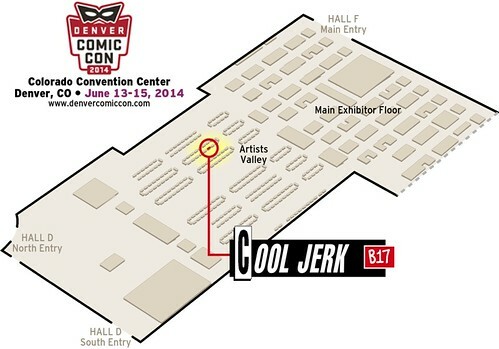 Cool Jerk » Archive » Cool Jerk and Denver Comic Con — a three-fer! Cool Jerk and Denver Comic Con — a three-fer! As required by Colorado state law, Cool Jerk will again be exhibiting at Denver Comic Con this weekend, Friday-Sunday (June 13-15). This is both Denver Comic Con’s and Cool Jerk’s third year and I’m really happy to be a part of it! Since last year’s DCC, I released Thinkulus (Cool Jerk Vol. 4) onto the world. I’ll also have more than 4 dozen varieties of my Cool Jerk Canvas Panels, a sure-fire crowd-pleaser! Beyond that, expect all my other books and some other cool odds and ends at the table. My sketches are always free so don’t forget your sketchbook! Since I’m flying to this convention, I can only pack a modest amount of books. Last two years I had sell-outs by show’s end, so here’s a PRO TIP: Buy early! Here’s a map I whipped up. Come find me at B17 in Artists Valley!